We had two days there between LA and the start of our road trip. Ben and I both know that two days is too quick for such an iconic city, but it is just our first trip there, our taster. We packed as much as we could into those days, so here is 36 (waking) hours in the beautiful San Francisco. The Bridge Coming from Sydney, another city where the bridge is a draw card, I was looking forward to seeing the Golden Gate Bridge in the flesh, or the steel. We started to walk along the coast from Fisherman’s Wharf, a pathway that took us up steep hills, and along grey sandy ‘beaches’. When it became apparent that Ben thought we were walking all the way to the bridge (about 11 miles), and I thought we were just walking to where we could see it, we had a minor tetchy moment, and then hopped a cab. This was of great relief to me, as I was fighting jet lag and the wind was doing my head (and eyes) in. The cab took us the eight miles remaining, and we were deposited at the lookout area. They have really spent some money here! I am sure at one time, this was just a semi-industrial lump of dirt that just happened to be under one of the world’s most famous bridges. Today it is a landscaped parkland with pathways and lookouts. The Bridge itself is stunning. It is long, proud and bright burnt orange. Yep, it deserves all the hype. Galleries Ben and I discovered early in our relationship that we both love galleries, and we tend to enjoy the small, boutique galleries most. On the way to the bridge, we happened upon a (what is the collective noun for galleries? A ‘monet’? A ‘picasso’? How about a ‘da vinci’?) a da vinci of galleries, all in a row. San Francisco has a plethora of galleries, and the handful we visited boasted impressive artists, including Dali at Franklin Bowles, and Warhol, Picasso and Rembrandt at Martin Lawrence. But perhaps my favourite, was a smaller gallery exhibiting artists not known to me. At Dennis Rae Fine Art, an artist called Thomas Arvid caught my eye, with his photographic style depictions of wine bottles and glasses. China Town We wanted to go to China Town for Chinese food, so we caught a cab on our first night. China Town was dead. A few stores were open, and there was only a handful of restaurants to choose from. We walked a couple of blocks, looking for recommended places, and came across a family style restaurant. It was filled with Chinese people, they were eating and they looked happy, so it was as good a place as any. Except it wasn’t. It was bad. We paid, we left, we tried to forget, and scolded ourselves for not having better directions. There are some spectacular things for sale in China Town, at shops with brightly coloured wares crammed into every space. I wanted to buy a silk purse, and maybe a paper lantern, but not then. I was not in the mood to buy something pretty. Little Italy On the way home from our spectacularly bad dinner, we inexplicably ended up in Little Italy, which we found on Columbus Ave near Washington Square. “Let’s go in a cafe and order dessert and some wine,” I suggested, wanting to resurrect our evening. We chose Panta Rei, for no other reason than it looked warm inside, and had an Italian man sitting outside, who said “Bueno Sera” back to me. It was warm inside, and smelled delicious. We ordered cheescake and a bottle of Lapierotta Sirah, on the waiter’s recommendation. Both were incredible. The flirtatious waiter brought bread and oil when we’d finished the cheesecake, and we settled in. We took our time, and left a little tipsy as we walked hand in hand back down Columbus to our hotel. Coit Tower On our full day in SF, we planned to go to Alcatraz. Once we’d bought tickets, we had about a two hour wait for the ferry. 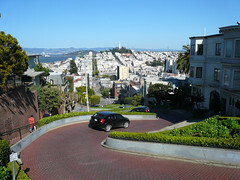 We wanted to go to the famous Lombard Street – the windiest and one of the steepest in SF, but we were a little far from there. A local directed us, instead, to Coit Tower, which is the highest point in SF. From where we were we climbed up dozens of flights of stairs through people’s backyards and alongside steep driveways. It was worth the climb. We paid the $5 to ride the elevator to the top – lots of Aussies and French that day. 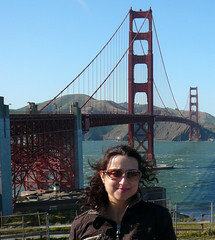 The views were incredible, and we could see Lombard Street, where we would go later that day. Alcatraz We paid $24.50, lined up, caught the ferry, and once on Alcatraz, we were free to do as we liked and could catch any ferry back that afternoon. Just as the ferry docked, Bob, a retiree with a gift of the gab, was starting his talk on famous escape attempts from Alcatraz. Bob moved the crowd of 50 a few times, pointing out various places, but the skill was in his story telling. We could just imagine the events unfolding as he described them. None of the stories had happy endings. Officially, no one escaped Alcatraz and survived. The rocks are razor sharp and the currents strong. We took the audio tour of the main prison block. Incredible. You can stop and start it when you want. 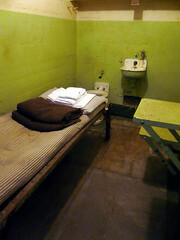 It guides you through the whole place at your own pace, and is narrated by a former warden and former inmates. I really enjoyed it. 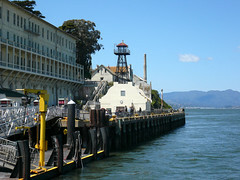 And of course, the most excruciating aspect of being on Alcatraz, is that is it SO close to SF. If the wind was right, inmates could hear the goings on of a city they could not step foot in. Fisherman’s Wharf We stayed right near Fisherman’s Wharf, so walked its footpaths several times. We ate twice at a restaurant called Tarantinos – once for lunch and once for dinner. The food was outstanding, and we returned for dinner our second day, as it is positioned so you can watch the sun set over the Golden Gate Bridge. Spectacular. Try the chowder! Tonga Room and Hurricane Bar There is a Tiki bar under the Fairmont Hotel in San Francisco. No, really. After dinner at Tarantino’s, we grabbed a cab, and headed up the hill. The Fairmont in SF is really impressive, and decorated in a Parisian style. We entered the lobby, ‘oohed’ and ‘aahed’ under our breaths and started our hunt for the Tiki Bar. Could a bar like this BE is a hotel like this? It just seemed so incongruous, but we went downstairs, turned a corner and there it was. We were two of 6 people in there, as it was a little dead on a Tuesday night, but we made our own fun. We ordered a cocktail for two, with enough alcohol to sedate a bull elephant. Lombard Street We hadn’t caught a cable car yet, so thought we could catch one up Hyde Street and then walk back down the hill via Lombard Street. The queue for the cable car was long, and we had just finished enormous Ghiradelli chocolate ice creams, so we walked up Hyde Street, which is so steep that your body is on a 45 degree angle as you go up. Paying penance for the ice cream, we grimaced at the people stuffed onto the cable car as it clanged past, “Lightweights,” I grunted. We made it, our walk up well worth it to see the novelty of a street where the footpath is steps and the street so steep that it switches back several times.